The Economic and Financial Crimes Commission, EFCC, on Sunday declared that the Ekiti State Governor, Ayo Fayose would be arrested. It said Fayose would be picked up after he loses his immunity. The Governor’s term in office expires on October 15, 2018. The agency tweeted the threat a few hours after candidate of the All Progressives Congress (APC) in Saturday’s governorship election in Ekiti state, Dr. Kayode Fayemi, was declared the winner. EFCC wrote at 12:37pm: “The parri is over; The cloak of immunity torn apart, and the staff broken. 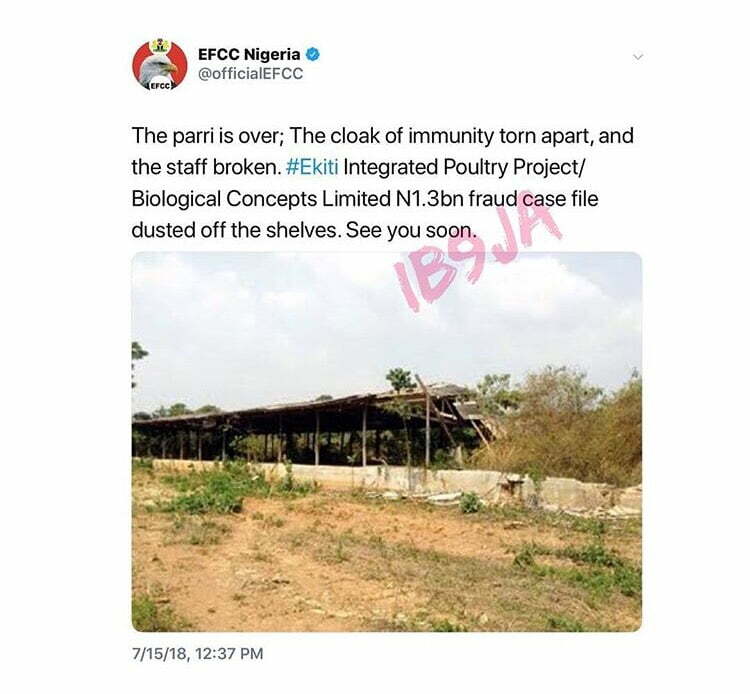 #Ekiti Integrated Poultry Project/Biological Concepts Limited N1.3bn fraud case file dusted of the shelves. See you soon”. But the tweet was deleted when DAILY POST checked at around 3pm. The statement has generated backlash with respondents accusing the agency of bias and targeting only political opponents of President Muhammadu Buhari. In response to one of the replies, EFCC said, “This case has been on since 2005, but became a pending case due to the immunity. There’s nothing new here. #NoWitchHunt”. Fayemi defeated his closest rival and candidate of the People’s Democratic Party (PDP), Prof Kolapo Olusola.